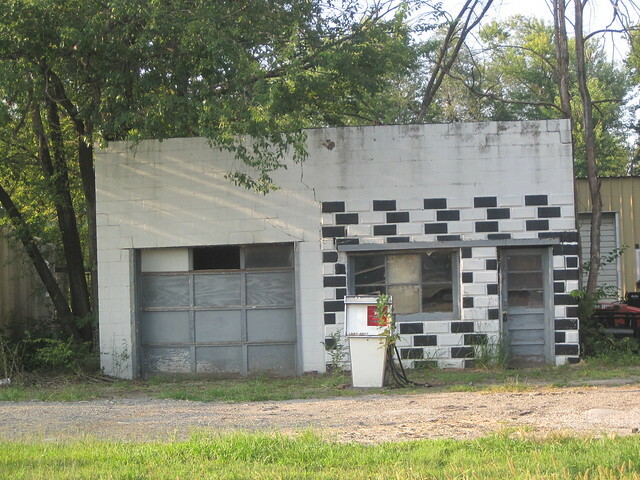 Starting at the east and moving west, one of the first Route 66 era landmarks is this concrete block gas station on the north side of the road. The black and white paint checkerboard marks the earliest section of a building that was later expanded. 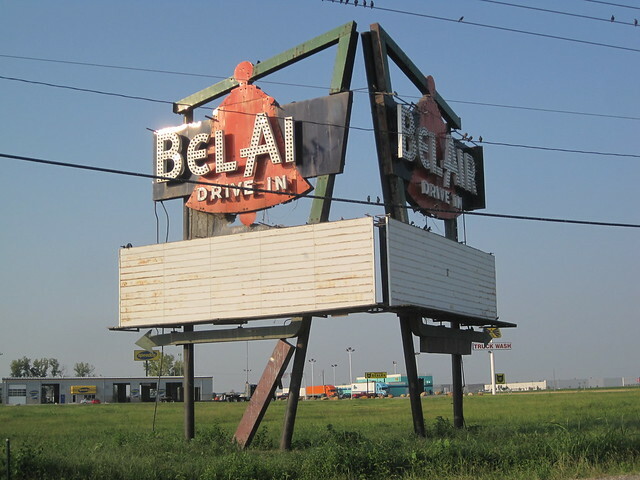 One of most impressive signs on Chain of Rocks Road is the old Bel Air Drive In sign, which faces an uncertain future. One of the large letters is already missing, but the sign’s bell still rings out with a swanky mid-century design. One of the metro east’s largest, the Bel Air Drive In opened in 1953 and could accommodate 700 cars. Mid-America Theatres built the Bel Air. The drive-in was so successful that the owners added a second screen in 1979, but times changed rapidly before the theater’s closure in 1986. Wreckers took down the theater buildings in 1991, and the site is now partly built out as an industrial park. The owner of the land has expressed interest in either retaining the sign on site or selling it, according to a 2007 Belleville News-Democrat article. Originally, the sign had a channel silhouette on each bell and then incandescent bulbs spelling out the Bel Air name. 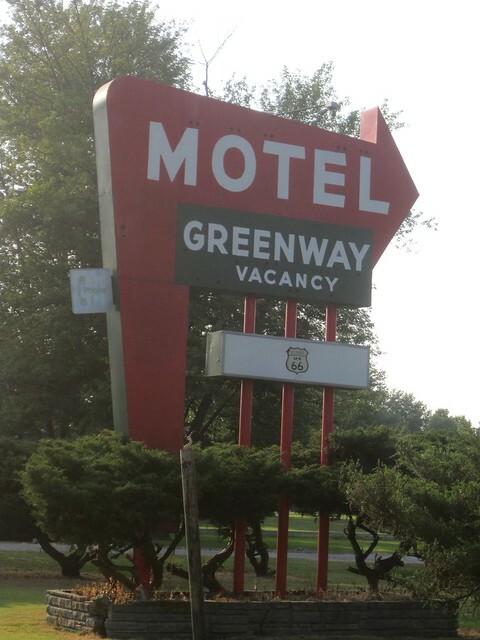 The Greenway Motel and the Apple Valley Motel remain in operation despite less traffic on the old Route 66. The Greenway sign is now bereft of its channel-letter neon tubing, but it is well-maintained and retains its historic two-tone paint scheme. 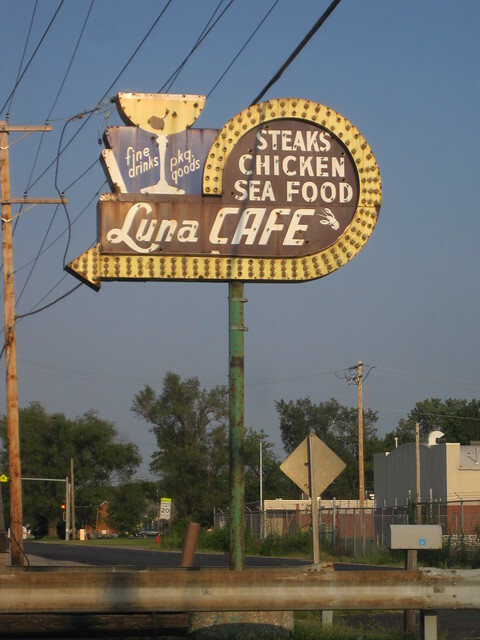 The Luna Cafe to the east pre-dates Route 66, and is located in a sprawling frame building from the 1920s. The sign went up later. The martini glass takes the eye on a swirling journey along an arrow pointing at the cafe. Time to pull over for refreshment! This entry was posted in Metro East, Mid-Century Modern, Neon, Theaters. Bookmark the permalink. The only thing I enjoyed more than this post was reading it in your voice. “Time to pull over for refreshment!” will have me smiling for days.